Green Planet is the beautiful home of the little mechanical life forms known as “Minirobots”. It was invaded by an army of ruthless robot troops that call themselves “The Machines”, who wanted to turn it into a space resort! Help the peace-loving Minirobots fight to reclaim their homeland. Build the ultimate team from 40 cute little robots to defend against a horde of 32 types of Machines that is coming over land, air, sea and even beneath the depths of the ocean! Use your wit and tactics to conquer the obstacles of an ever more challenging and fun storyline that spans three episodes. 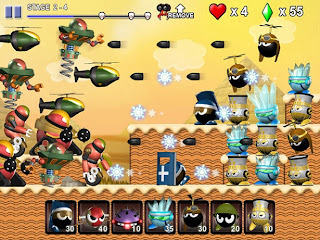 Collect energy and metal parts to build your army while shooting, slashing, zapping and bombing the enemies. 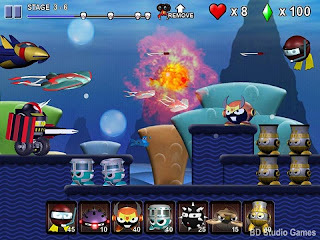 You’ll also experience new ways to fight in heaps of great mini-games. Stand united with the Minirobots and prove that size doesn’t matter!